If you are looking for a way to stretch your budget and improve your family’s nutrition, consider adding more beans to your meals. Beans are convenient, versatile and lend themselves to many tasty dishes. Beans are a rich source of protein, fiber, vitamins and minerals. 1.) Rinse beans: Give beans a good rinse with cold water and pick out any debris. 2.) 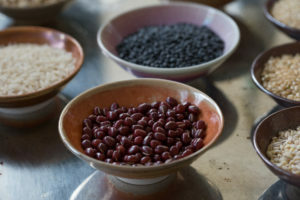 Soak beans to reduce cooking time: Cover beans with a few inches of water, let sit 6-12 hours. *If you do not have time to soak beans, that’s ok- either use the crockpot method or just expect a longer stovetop cook time. 3.) When you are ready to cook the beans: heat the olive oil in a large pot, and sauté chopped onion, celery, carrot, and garlic, along with bay leaves and oregano (you can get creative with your seasonings here)! Add in the soaked beans and liquid, along with more water to cover the beans by a few inches. 4.) Boil: Bring to a boil and continue to boil for 10-15 minutes. 5.) Simmer: Reduce to a gentle simmer and cover, leaving a crack in the lid. 6.) Relax! : Let the beans simmer for 45 minutes – 2 hours, depending on the variety of bean. Check the beans occasionally, and add more water to the pot if the liquid level gets low. 7.) Adjust seasoning: Beans are done when they are soft but not mushy. Try picking up a couple beans in a spoon and blow on them- if the skins wrinkle, that is a good sign they are ready. Once beans are done, turn off heat and season however you want. Think about what flavors best fit the meals you have planned. Include an acid, like lime or tomato, along with spices such as cayenne, thyme or cumin. 9.) Refrigerate or Freeze: Divide beans into meal-sized portions and pack in reusable, airtight containers to go in the freezer up to 6 months. Make sure to store beans in their cooking liquid to prevent them from drying out. 1.) Proceed through step 3 of the stovetop method. You can soak beans or not, just anticipate a longer cook time on un-soaked beans. If you are cooking kidney beans, boil for 10 minutes before adding them to the crockpot. 2.) Add beans, vegetables and spices to crockpot and cover with a few inches of water. Set crockpot on low for 6-8 hours or high for 2-4 hours. Check on beans occasionally, as cook time will depend on the type of bean and your crockpot. Add salt when close to done. 3.) When tender- adjust seasoning, cool, and store as mentioned above. “The best things in life are worth waiting for” – Inspiration for cooking dried beans. Hannah Ruhl loves all things related to food! 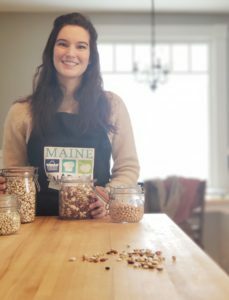 Her passion began at a young age gardening and cooking with her mom in Northern Maine. Hannah has experience in Nutrition, cooking, education, research and community mobilization. Her favorite foods (today) are green beans, blueberries, dark chocolate and fish.